It’s the first day of school for tens of thousands of elementary and secondary students in Windsor and Essex County. No doubt many parents are breathing a collective sigh of relief that their little darlings are no longer moping about the house or pestering them to take them to a friend’s house or to the mall. Being a parent of a Walkerville Collegiate student myself (who fortunately was able to fill her days this summer without too much parental help) I thought back to my own first days at school and how exciting they always were. Especially because they meant I finally had new shoes. 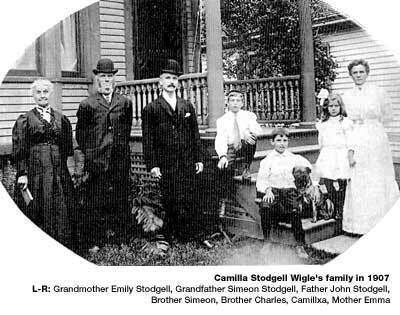 A few years before she died at 107, (yes, you read that correctly) Camilla Stodgell Wigle, who had an incredible memory of her very long life in Windsor/Walkerville, provided this account of just what it was like to attend a one-room school house. I started school at five or six years of age, which would be 92 or 93 years ago. I just can’t believe it’s been that long. I went to S.S. #1, Township of Sandwich East Public School – later Riverview Hospital on Riverside, where all classes from grades one to grade eight were taught by one teacher. We didn’t seem to mind and each grade had their own sitting place and as we were assigned to our work or studies, we seemed to concentrate on what we had to do, and didn’t listen to the teacher talking to other students of different grades. Classes would be asked to go to the front of the room, in a line to be asked questions and to write on the blackboard, or do arithmetic. That was fun. I must say some of the girls and boys in lower classes would listen in to what the teacher would be teaching the upper classes and this way gain knowledge. Sometimes, when a know-it-all spoke up, they would be called “Smart Alex”. A potbelly stove at the front of the classroom gave us heat in the winter. Sometimes the back of the room would be so cold! When the stove needed more wood to burn the teacher would say, “Billy would you please go out and bring in more wood for the stove.” In cold weather, that was a shivering job – poor Billy’s hands would be so cold, he would stay for a while beside the stove until his hands warmed up. School started at 9 a.m. and at 10:30 we all had to go out for recess. Only those who had a cold or something would stay inside. To have a drink of water, there was a pump outside with a handle on it and I remember a tin cup on a chain, and a hook to hang it on. Oh how cold that water was! Water fights often occurred and then we had to stay in at recess for punishment. I often wonder how the new generation would cope, we didn’t have the conveniences then as now, and we had two outhouses to go to when nature called – one for the boys and one for the girls and we had to use newspapers or pages from magazines for hygiene sake. Can you believe this? I bet it’s hard for you even to think of those days but I lived through them and I don’t think it hurt one or any of us. It made us strong, obedient and truthful. We adored our teacher and respected her wishes! When we didn’t obey, our parents would enter into the scene and would reprimand us for disobedience. We had to respect religion too and always began our school day with the Lord’s Prayer. Sometimes, one of the older pupils would read scripture – no matter what colour or religion the pupils were, they all knew their God was the one they worshipped, so all was harmony among us all. We had great holidays too. On Dominion Day as it was called then, we all gathered around the flagpole when our national flag was raised, stood at attention, and saluted it with dignity and pride, our voices soaring toward the sky. We looked at the flying flag with love for our country. Singing “O Canada” I can remember having chills running through me. I guess I was just happy for all the good things I had. Our one room school became too small in a few years and a new room was added on. What a thrill it was to know we were to have two rooms. Boy oh boy! Not to have a crowded room was great. Things changed a lot. New ideas were put to practice but we always had the inner feeling of closeness and friendship, which never died – even when we graduated. That fellowship never left us even though we left our dear school for good to enter into higher horizons of learning. We may have had a hollow feeling inside, but greater things were in the future for us. I hope all those who were my friends and companions remembered our one room schoolhouse with great joy and through the years used the knowledge and teachings from our beloved schoolteachers. Three I remember to give them honour: Miss Hand, Miss Richards and Miss Briody. 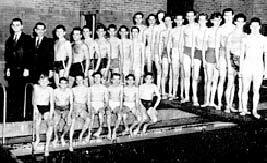 This entry was posted in Fashion, People, Walkerville, Windsor Now, Windsor Then and tagged 1907, 1940s, classic, classroom, commericals, education, Exederin, flag, headache, honour, now, O Canada, one room schoolhouse, outhouse, salute, school, schoolroom, swim team, teachers, then, tv, Walkerville, WalkervilleCollegiate, Windsor. Bookmark the permalink.